VirtualOulu is a detailed 3D city model of Oulu, Finland implemented as an open innovation platform for developing new 3D applications. 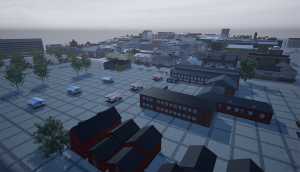 VirtualOulu contains more than 30 texturized city blocks of Oulu downtown area and the public areas of Oulu University campus, which have been manually modeled by the following companies: eVocons, LudoCraft, CubiCasa, VALO Company and the University of Oulu. This work has been coordinated by the Center for Ubiquitous Computing (UBICOMP) at the University of Oulu. Click this to dive into VirtualOulu using your web browser. VirtualOulu is available as runtime exports (FBX files, Unreal Engine project and Unity3D project) and source materials (Blender and 3DMax). (1) runtime exports are licensed under CC by Attribution. (2) source materials are licensed under CC Attribution-ShareAlike. In practice, runtime exports can be used in any way including commercial products as long as appropriate credit is given. Any modifications to the original source files have to be shared. The motivation is to allow open utilization of the models while also ensuring that improvements to the models are shared so that the good and up-to-date version of VirtualOulu would be publicly available. The repository utilized is a “live” one, meaning that content updates are still coming frequently. Download 3D models for VirtualOulu in an FBX format. Download VirtualOulu as an Unreal Engine project. Download VirtualOulu as a Unity3D project. Download the source materials for VirtualOulu. VirtualOulu is also available as a live database of 3D models. Live 3D model service is used by sending geospatial queries to its API using HTTP. The service provides the 3D models in FBX or glTF formats. The service is at http://live3dmodelservice.ubicomp.oulu.fi. (1) API description for the live 3D model service. (2) Example application for creating geospatial queries. Unreal Engine application that provides immersive VR views of selected locations how they could look like in 2040 according to the visionary plans of City of Oulu’s City Planning division. A Unity3D project in which one plays as a janitor who aspires to get from one end of the Oulu University campus to the other as fast as possible. A realXtend/Meshmoon based playful and game like storytelling environment for all ages. It combines a real stage and a virtual stage into a hybrid reality stage where people. A Unity3D project in which players roam on the streets of physical and virtual city in a “role playing game”. In the game, each game round culminates in a “boss-fight” fought in the Virtual City. The Virtual Library application was developed in a collaborative effort with Oulu city library. The user can move from the physical library into various fantasy realms. Source material is available as Unreal Engine project. Alatalo T, Koskela T, Pouke M, Alavesa P & Ojala T (2016), “VirtualOulu: Collaborative, immersive and extensible 3D city model on the web” Proc. 21st Annual International Conference on 3D Web Technology (Web3D), Anaheim, CA, USA, 95-103. PDF DOI=http://dx.doi.org/10.1145/2945292.2945305. All content related to VirtualOulu are provided as is without any guarantees for correctness and quality.